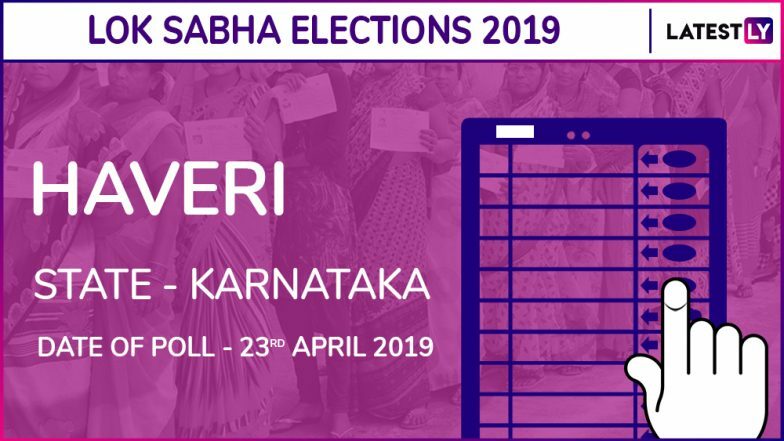 Haveri is one of the Lok Sabha constituency out of the 28 constituencies in the Indian state of Karnataka. This constituency was created as part of the delimitation of the parliamentary constituencies in 2008. The first election of this constituency was held in 2009 and Shivkumar Chanabasappa Udasi from Bhartiya Janata Party(BJP) was elected as the first Member of Parliament. Here the general election 2019 will be held on April 23 as per phase III schedule made by Election Commission of India. The parliament constituency number of this seat is PC No. 10. Lok Sabha Elections 2019 Schedule: Voting In 7 Phases From April 11 to May 19, Counting And Results On May 23; Check All Dates For General Elections. Bhartiya Janata Party (BJP) has nominated Shivkumar Chanabasappa Udasi while the Indian National Congress (INC) has chosen DR Patil for the General Election 2019. The Election Commission has declared April 4, 2019, as the last date of filing on nominations from the seats. The last date for withdrawal of candidature is April 8, 2019. Lok Sabha Elections 2019 Phase III: List of States And Constituencies Voting On April 23. In the general election 2014, Shivkumar Chanabasappa Udasi from BJP continues to retain his seat, as he defeated Saleem Ahmed from Indian National Congress (INC) by a margin of 87, 571 votes. The BJP candidate secured 5,66,790 votes. The total turnout of voters was 11, 15, 968 voters. The 17th Lok Sabha Polls will be held throughout India from April 11, 2019, and will continue till May 19, 2019. The polling will be done in 7 phases. The result for each phase will be declared on May 23, 2019.